We hope everyone has a fun and safe Labor Day weekend. If you need bird feeding supplies don’t forget to stop by on Friday or Saturday. The Wood Thrush Shop will be closed Monday September 3rd. We will re-open on the 4th at normal hours. Things are starting to slow down a bit at seed feeders, so I thought it would be a good time to revisit some old blog posts that are still very relevant for this time of year with the upcoming fall migration. Click on the linked title of each blog post to see the entire post. Peak time for Hummingbirds: As many of you are aware the Hummingbird activity has geared up quite a bit since mid-August. Click here to read our blog post detailing all the reasons we see so many of these little birds this time of year. Hummingbird Happy Hour: Don’t forget there is still time to purchase tickets to the Hummingbird Happy Hour at The Warner Park Nature Center on September 7th. Proceeds from ticket and art sales will support the Bird Information, Research and Data (B.I.R.D) programs. Click Here for more info. Drippers, Misters and Moving Water: This time of year water can be scarce. Having a clean fresh birdbath is a great way to attract birds. Click here to check out this blog post all about adding moving water to your birdbath or backyard water source. The Warner parks have been conducting bird research since the 1930's. Today, Park staff and volunteers conduct extensive banding and bird counts, and take part in Project FeederWatch, a survey of winter bird populations across North America conducted by the Cornell Lab of Ornithology and Bird Studies Canada. 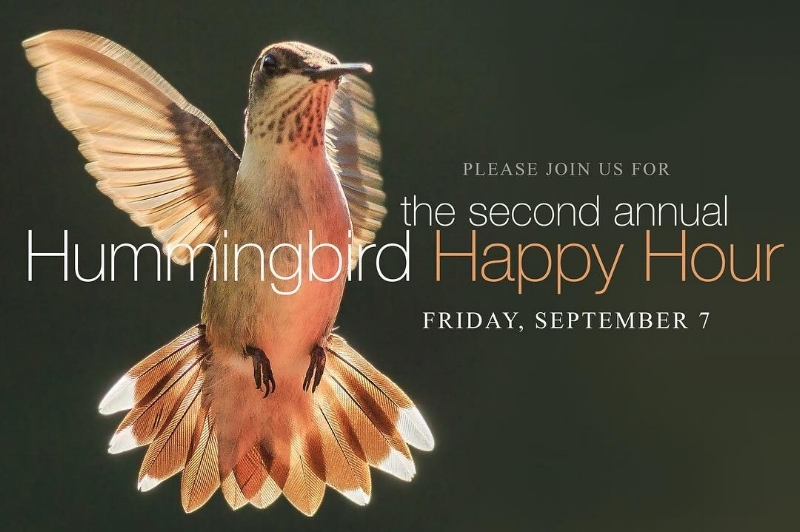 Join the Warner Park Nature Center for the second annual Hummingbird Happy Hour on Friday, September 7, 2018 from 6:00pm- 9:00pm. Proceeds from ticket and art sales will support the Bird Information, Research and Data (B.I.R.D) programs, keeping these programs free and available for schools, families and Park visitors. Tickets are available for purchase at the Warner Park Nature Center or online through the Friends of Warner Parks website. Click Here to purchase tickets.